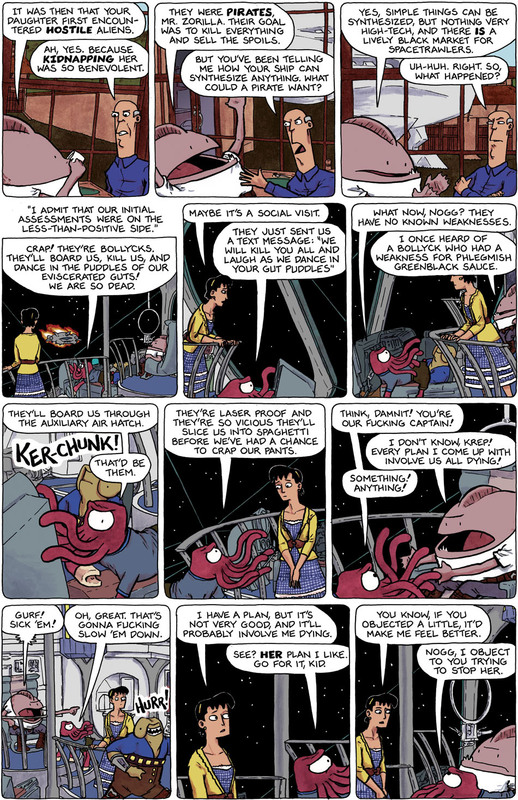 Tomorrow is the final day of my comic strip, Little Dee, which many of you have come from to read Spacetrawler. It’s been a struggle running both strips simultaneously these last 3 months, even more-so in the last few weeks as I prepped the final Little Dee book and limited print. In ways it has helped, it has forced me to find the balance I need in creating Spacetrawler, somewhere between obsessive-level craftsmanship and simply getting the damn thing done. I’ve had to make choices: which details I was doing for the benefit of the strip and which simply for my own over-perfectionist side. I think the results have been good. I am now looking forward to spending more time on building their ship, the IA Star Banger, in Sketchup. Right now it is a hull full of houses of cards. But I understand the process now, I know how to build the inidividual models, how to use the software quick and dirty and find looks I want. Anyhow. 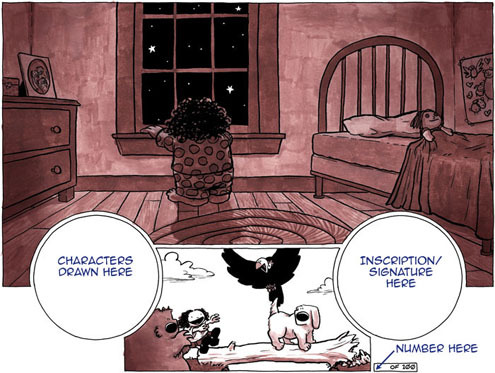 If you don’t know Little Dee, read it, and support me in my creatings: buy the books, buy the print. Or look for my other products at Topatoco. p.s. – did you know I also blog about food? I do. Well, I’ve been out of that loop the last four months due to the release of Spacetrawler. But Sunday night I got back in the saddle and made Rhubarb Jam. It took 10 minutes and was awesome. Bollycks? As in “when the pirate got close enough I kicked him in the Bollycks”? 3. Where are the Little Dee t-shirts? I mean, besides “LibrArian” and “Rogues of Wool”. Where is the Undead Flamingo printed on “… soft and comfortable black American Apparel 2001 and 2102”? If you can draw Yuri wearing a “Dresden Codak” t-shirt, why can’t Aaron Diaz draw one of his characters wearing a shirt with Vachel looking cool, or the “Evil is Awesome” zombie possum? BECAUSE YOU HAVEN’T MADE THE SHIRTS, THAT’S WHY! (P.S. If you DO make some more Little Dee t-shirts, maybe you could include the quote about “Tummy Manifest Destiny”? Sorry, JKC, no Dee T-Shirts are planned! They’re vicious space pirates, and they send *text messages*!?! Herander: and then they tweet about it. They are vicious text messages!